I’ve mentioned here on the blog before that I don’t particularly care for roller coasters. I just don’t get the thrill of trying to scare the crap out of yourself. “Here, I’m going to push you down this hill at a speed fast enough to make you think you might die.” Why, yes, that sounds like loads of fun. Sign me up. One of the pitfalls of having children, though, is that they often want to do things you do not. So, of course, when my family went to the Magic Kingdom last week, what was the first thing my kids wanted to do? Ride the Dumbo ride? Spin on the tea cups? Cruise through pirate-infested waters? No, of course not. 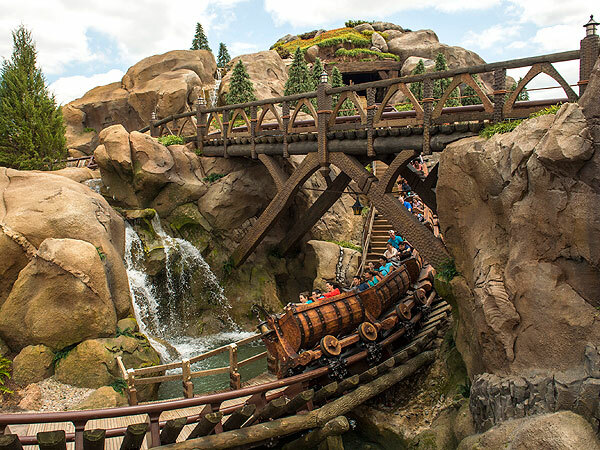 Space Mountain, Splash Mountain, the Seven Dwarfs Mine Train… Basically, anything that would drop us from a great height at an even greater velocity. I’ve gotten into this kind of odd habit of setting mini-goals for myself in certain situations these days. For example, I might challenge myself to say one ad-libbed thing to the waiter or waitress if I go out to eat. It may not sound like much, but it gives me a little sense of accomplishment here and there. In the case of Disney World, I set two: Strike up a conversation with a stranger (which I never, ever do) and raise my hands on a roller coaster. The stranger part actually happened pretty naturally. For some reason, Disney World just seems to be conducive to striking up random conversations, and I was fortunate enough to stumble upon one waiting in line for one of the rides. The raising of the hands? Well, that was a bit more difficult. See, when I feel that first drop coming on, I apply the death grip to whatever’s in front of me. I actually had a sore back after riding Space Mountain because my body tensed up so much. I am not the dad you see in pictures with hands in the air and a smile on his face. I failed on Space Mountain, the mine train, and Splash Mountain. 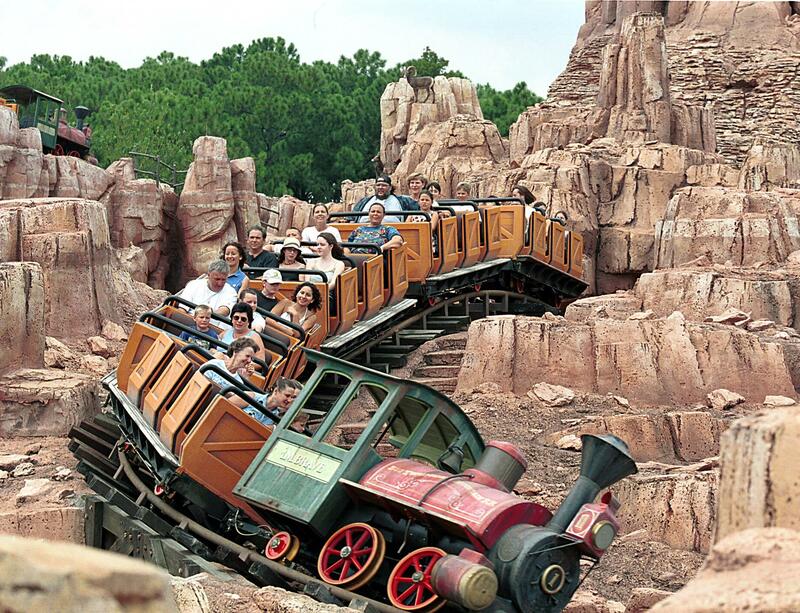 Thunder Mountain Railroad was my last shot. I looked up and saw the big mountain and thought, “Oh, no, this isn’t going to work at all.” For some reason, though, my confidence had been building throughout the day. I guess not dying on the other three rides was giving me a boost. So, in the first turn of Thunder Mountain Railroad, I did something I had never done before: I raised my hands on a roller coaster. I would imagine there are a few of you saying right now thinking, “Pfft, that’s not even a real roller coaster. Go through some loops and then pat yourself on the back.” Well, baby steps, I say. So what if I got my hands up on a small roller coaster. That’s better than I’d ever done before. There’s something about hitting those mini-goals that goes a long way for me. So when the ride ended and I was still alive, I felt pretty darn good. A bit silly, but pretty good. Now, am I going to go back one day and hop on the Rock ‘n’ Roller Coaster? Um, probably not. And I won’t even get into how our trip to the resort pool went (Note: I can’t swim.). But, you know, you have to claim the small victories when you can, right? Maybe I’ll even get my hands up on two roller coasters next time.